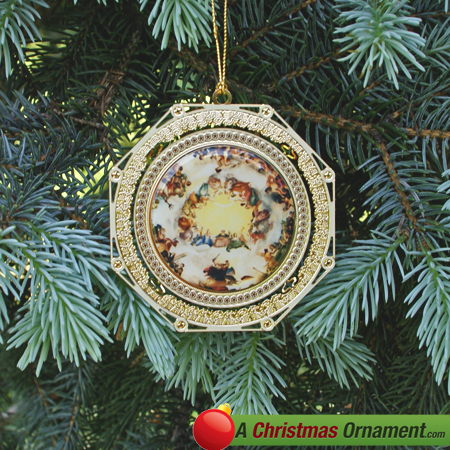 Christmas Ornaments Made in USA - 2009 Apotheosis of George Washington Ornament (3rd Series) - A Christmas Ornament Co. The 2009 Apotheosis of George Washington ornament (third series) is part of the "America's Christmas Ornament" collection which celebrates the art inside the U.S. Capitol. Constantino Brumidi has been called "the Michelangelo of the Capitol because of his extensive work in decorating the Building. Born in Rome in 1805, Brumidid had executed important commissions there before emigrating the the United States in 1852. He first demonstrated his skill in fresco painting in the Capitol in 1855; he spent much of the next 25 years working in the building, decorating committee rooms, reception rooms, the Senate corridors, and the the Rotunda, until his death in 1880.